Website: Click here for Facebook event! 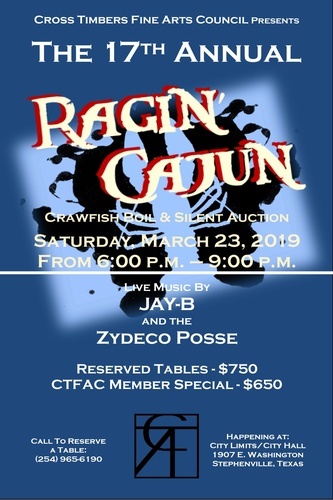 This fundraiser is fun for the whole family, not only do we have crawfish, crowns, and celebrity waiters, but every contribution is going back to support art in our community. Continuing with the Mardi-Gras theme, a plethora of masks, beads and live zydeco music liven up the night. With great food, lots of locals, and digging into piles of spicy boiled seafood, this is the crawfish boil, you don’t have to travel to Louisiana to enjoy. You don’t have to be Cajun to love crawfish! Each person will be served enough crawfish, corn, shrimp, potatoes, beans, rolls and sausage to satisfy any craving. And feel free to take some to go! Continue to show your support by browsing the silent auction items generously donated by the Cross Timbers community. You will never know what you might find in each basket! Click HERE to view their online auction and bid! A table of 10 is $750 and members get a discount!